All social media apps come with some security concerns. Facebook, for example, is an all-in-one platform that allows both public and private posting but also makes it quite easy for scammers and predators to find and communicate with victims. One solution to this is invite-only video chat. With video chat, it’s more difficult for scammers to pretend to be someone else, and the invite-only nature makes it more difficult for predators to find their victims. The Houseparty app is a perfect example of this. The app does away with the public face that most social media apps present, instead allows users to privately invite others into video or text chats. This allows for easier vetting of the individuals one is chatting with, but it also presents major privacy and security concerns for families. 2 How does Houseparty work? 5 Should parents be concerned about Houseparty? 6 Can teens use Houseparty safely? Houseparty is a private video chat app available on iOS, Android, and Mac OS. The app’s primary purpose is group video chatting, although users can also send text messages through the app. The app has been available under its current name since 2016 but was originally launched in 2015 as a live broadcasting app called Meerkat. Life on Air, the development company behind Meerkat (now Houseparty), decided to switch gears on the app shortly after its initial launch. By 2016, Meerkat was rebranded as Houseparty. The new version of the app changed gears away from a Facebook Live-style public video live stream toward private group chats similar to ooVoo. Houseparty now has over 20 million users, 60 percent of which are between the ages of 16 and 24. Although Houseparty’s advertising appears to only feature individuals in their 20s, the app is distinctly popular among those under the age of 18. The app allows users as young as 13 to sign up for an account and does little to prevent those younger than 13 from falsifying their age to sign up. Houseparty also subtly includes imagery and phrasing that could be construed to be encouraging illicit behaviors. 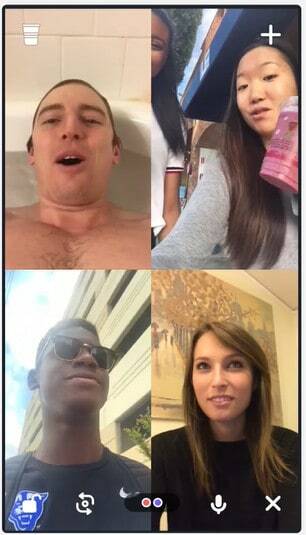 For example, the service features imagery on its homepage of a group video chat with a man connecting in with friends while he is presumably naked in a bathtub. This kind of tongue-in-cheek phrasing exists throughout Houseparty, which is culminated in the app’s iconography of a red, plastic cup, a symbol of party culture. None of these items indicate that Houseparty is intentionally encouraging illicit behavior or deviant activities from teens or younger adolescents. However, because the messaging is ambiguous, it’s possible teens and younger adolescents could interpret them that way. Houseparty is designed to eliminate some of the privacy concerns that exist with most public social media apps. It does this by mostly eliminating the public presence common with other social media apps like Facebook or Twitter. Users cannot search and find others. Instead, Houseparty only allows users to add people they already know via Facebook or their device’s contacts list. Houseparty also has an option to add other users who are in close proximity to you using a location-based “Near Me” option. Location-based searching can be turned off, however. When you log into the Houseparty app, you’re immediately greeted with a video of yourself via the front-facing camera, and a list of any other users also logged into the app. 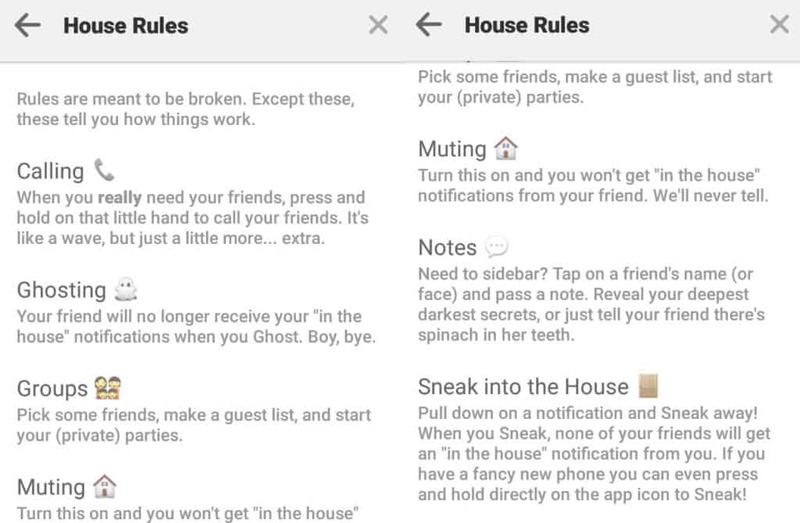 Logging in will also send other Houseparty users an “in the house” notification, alerting them to your presence in the app. Houseparty starts you out in your own room, at which point you can either join someone else’s room if it’s open or invite others to join you in yours. In general, each room is effectively “open” unless a user specifically chooses to lock it and prevent others from joining. And while others are alerted to your presence, notifications can be turned off. Additionally, it’s uniquely difficult to locate new users, as this option is relegated primarily to individuals you already know from other places or other social media apps. Although its more private focus makes it less of a privacy concern, there are still many ways that the service can be abused. As a video chat app, it can still be used by sexual predators to discretely communicate with minors, for example, making it a concern for parents. That said, the app has a number of settings and features intended to make it far more difficult for predators to use as a medium to find victims, in comparison to other social media apps or chat apps like Kik. Users can also lock the room using a lock button on the bottom left side of the app’s interface. This prevents anyone from joining the room, including preventing other users from joining your room per invite from anyone else. As with most social media applications, Houseparty collects a lot of personal data. When you first sign up to Houseparty, you’re not only required to give your email address and date of birth, you also need to give the app your phone number. The app claims to use your phone number to verify you’re a real person, but it could just as easily use a different verification method, such as a Captcha. In order to add friends, you must also give the app permission to access your contact lists, and optionally, your Facebook friends list. As a result, you also must consider that you’re giving away your friends’ data to the app’s developer, Life on Air, to include their names, phone numbers, and other information that may be available through their social media accounts. Although Life On Air technically requires users to be 13 years old or older, there is no way for the service to verify a users’ age. This means users younger than 13 can sign up without consequence, although Life On Air states in its Terms of Service that it reserves the right to force forfeiture of any account. The service states that it will also collect IP addresses, MAC addresses, cookies, mobile carrier information, geo-location, pages you’ve visited before and after using the service, time spent using the app, and more private information not directly related to the service. Should parents be concerned about Houseparty? Thankfully, Houseparty’s format improves on many of the safety issues that most social media apps possess. Even still, parents should be aware of the fact that their children’s private data is vulnerable through Houseparty, and that the service can still be used for discrete communication. Can teens use Houseparty safely? It is possible for teens to use Houseparty safely. It’s also possible for parents to monitor teen activity as well. Here are a few tips for parents to help guide teens who are using Houseparty. Because Houseparty doesn’t have a search function, it nearly eliminates the danger of strangers looking them up. However, it is still possible for strangers to contact teens on other services, such as Facebook or Twitter, and ask them to connect on Houseparty. Let your Teen know that it is best to only add people they know in real life, and to avoid adding anyone outside of their age range who is not a family member or friend. Under Section 5 of its Terms of Service, Life On Air gives users the right to opt out of certain data uses and sharing. This won’t keep the service from collecting data, but it will limit what they plan to do with it. Even then, Life On Air claims that opting out doesn’t completely prevent them from collecting or using your data. The service states, “we may still collect and use non-Personal Information regarding your activities on our Services and/or information from the advertisements on Third-Party websites for non-interest based advertising purposes, such as to determine the effectiveness of the advertisements. You can opt-out by sending Life On Air an email to hello@houseparty.com. Your teen may fight back against adding you, as many teens prefer not to add their parents to their social media accounts. However, make it a condition of them using the service. Additionally, make it so your teen does not block their “in the house” notifications from you. And when you see they are on, make sure they allow you to check in on their chat rooms on occasion. Note that we do not recommend invasion of your teen’s or child’s privacy. There are, however, some apps that let you monitor your child’s phone, allowing you to receive location data, information on app usage, and text messages. Some of these apps even allow parents to lock the other phone remotely. Apps like mSpy and MamaBear give parents greater access to what their kids are doing on mobile devices, but do some at the cost of increased privacy concerns and potentially damaged relationships with your children. Local laws can vary, but in some places teens and kids can be tried as adults for creating and sharing pornographic images. It’s important to discuss these issues with your children who may be using social media. It’s also important to share with them the fact that illicit content can easily be recorded by anyone. Houseparty has a feature that lets users know when someone else in the chat has taken a screenshot, but there are ways users can get around this. Other users can record or keep images and video without consent. Given the privacy concerns, it may be in a parent’s best interest to disallow the use of Houseparty altogether. The app’s creator has gone to some lengths to keep the video chat app from being misused. However, parents should still have the last word on their children’s use of the app. Hi Bailey! The primary focus for Houseparty is eliminating public presence. You can’t publicly search for others, you have to invite and be invited to communicate with each other on the platform. That offers some inherent safety and privacy that isn’t available with other social media platforms that thrive easy connections across a wide spectrum of users (like Twitter and Facebook). Wow, this was very interesting. This raises too many concerns about privacy, and security.